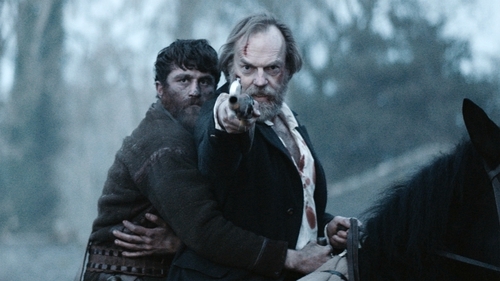 Lord of the Rings and The Matrix star Hugo Weaving has told RTÉ Entertainment that he sees his new film, the Famine revenge thriller Black 47, as an Irish Apocalypse Now. Directed by Lance Daly, Black 47 tells the story of Feeney (played by Australian actor James Frecheville), an Irish Ranger who has been fighting abroad for the British Army but becomes a deserter and returns home to Famine-ravaged Connemara. When he discovers what has happened to his family, Feeney swears vengeance. His old British Army comrade Hannah (played by Weaving) is then dispatched to put an end to Feeney's uprising. "It's very similar to Apocalypse Now and [its literary inspiration] Heart of Darkness, really," said Weaving. "That journey through a hellish landscape to something. What's going to happen to Apocalypse Now character Kurtz, to Black 47's Feeney? "There's that sense of moving into and through a landscape - that sense of foreboding - to a destination. And you know there's going to be a showdown. You know these two men are going to clash and someone's going to die. "You know there's going to be a showdown"
"Same with Apocalypse Now - Hannah is [Martin Sheen's Apocalypse Now character] Willard." Weaving, whose only previous visit to Ireland had been on a family holiday as a 14-year-old, said he was "really interested in coming over here again" and jumped at the role of Hannah in Black 47. "Being in a landscape, being in a different culture is great 'food' for me," he enthused. "And so sitting in Ireland on a horse in the middle of winter, with the wind blowing and the rain pouring, I love that!" While he enjoyed the shoot, Weaving said he never forgot the weight of Black 47's source material. "Knowing a little bit about The Famine - history was my thing at school - I was sort of fascinated by it," he explained. "That journey through a hellish landscape to something"
"The trauma of The Famine is still with Ireland today, isn't it? You think of displaced people - Syria now - they've left and what do they do? What do their children do and their children do and what do their children do? Syria's still in their blood. "There's a great responsibility with this material and it's really hard - how do you put it up on film?" Weaving paid tribute to Black 47 director Lance Daly for "his tenacity and his research and his determination to bring this traumatic event onto the screen". "To always be thinking of that," he added, "but also to be thinking, 'How does the 'packaging' work without appearing like packaging?'" Reflecting on his Irish experience, Weaving said he would "love" to come back to make another film. "Just being here was great," he said. "In terms of budget, I'd rather be on a smaller film. Generally, the bigger the film, the worse the communication is! Generally. "The more people there are, the harder it is to know what's going on. It's just harder to get things going. On a big studio picture it tends to be, 'Here's the money. Just sit there. Wait. I'll tell you when you're needed'. Whereas a film like this, you've got to all work together." Black 47, which opened in cinemas last week, has already enjoyed the highest opening for an Irish film at the Irish box office since John Crowley's Brooklyn in 2015. For more movies news, click here.